“I will stop the motor of the world.” Atlas Shrugged, 1957. “The world economy runs on GPS.” Bloomberg, 2018. So quite literally, switching off the GPS would be tantamount to stopping the motor of the world economy. This underscores the indispensability of location and geospatial data and its utility in a world that is getting increasingly digitalized. As we move towards the Fourth Industrial Revolution, geospatial is becoming ubiquitous and by default the go-to technology in all domains. 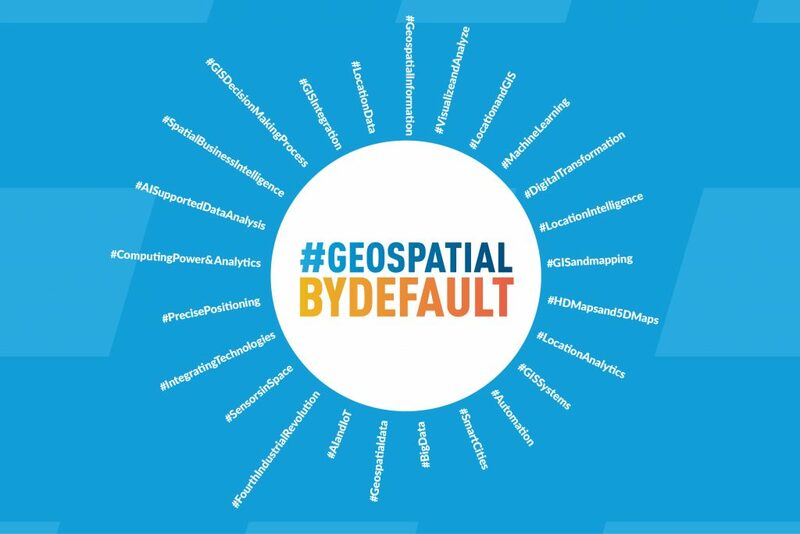 #GeospatialByDefault embodies this reality and positions geospatial as the great enabler, and the linchpin of future innovation. Be it our day-to-day activities or cutting edge futuristic research, modern day agriculture, construction, or business planning, geo information has become an essential prerequisite in every field. “Geospatial technology has always been the backbone of society,” says Steven W Berglund, President & CEO, Trimble. However, the transformative potential of this technology is yet to be fully harnessed. 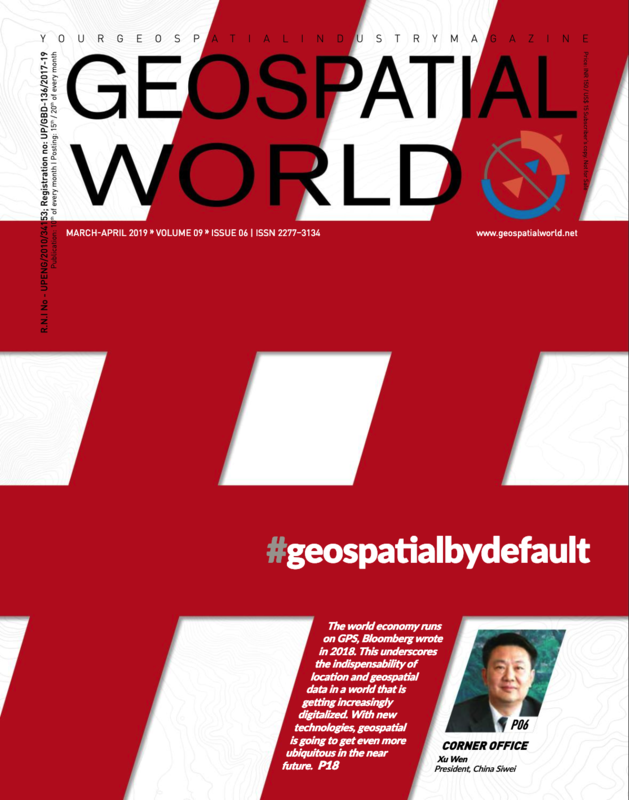 “Geospatial data allows us to create digital versions of the physical world via sensor technology for reality capture. This opens up a world of possibilities,” says Ola Rollen, President & CEO, Hexagon. While the industry leaders have spoken highly of the technology, its adoption is principally dependent on government agencies, including defense. Though private industry and NGOs are also taking this up increasingly, they have not yet reached the level of governmental usage. For example, consider the usage by one department of the Government of India. The Department of Agriculture, Cooperation and Farmers Welfare in India established the Mahalanobis National Crop Forecast Centre, in 2012, for operationalization of technology developed in the Indian Space Research Organisation (ISRO), for crop production forecasting. The department has another center called Soil and Land Use Survey of India, which uses satellite data for soil resources mapping. Currently, it is using space technology for its various programs and areas, such as, Forecasting Agricultural Output using Space, Agrometeorology and Land-based Observations (FASAL) project, Coordinated Horticulture Assessment using Management using geoiNformatics (CHAMAN) project, National Agricultural Drought Assessment and Monitoring System (NADAMS), Rice Fallow Area Mapping and intensification, geo tagging of infrastructure and assets created under Rashtriya Krishi Vikas Yojana, and Crop Insurance. “Geospatial information is beginning to play a role in this (digital) transformation and is being seen as one of the fundamental keys for enabling digital integration,” emphasizes Jack Dangermond, Founder & President, Esri. 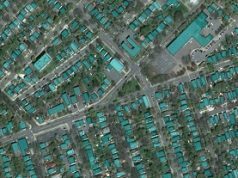 With such adoption of geospatial tools, not only from space, but also by using UAVs and other evolving technologies, Geospatial By Default is making significant progress. New trends in geospatial technologies are expected to impact multiple sectors and foster path-breaking innovation. What are these innovations and how do they impact Geospatial By Default? As Big Data gets bigger and the world gets more digitalized, businesses must become more analytics-driven to sharpen their competitive edge. While this is not easy for an industry that traditionally has been product-oriented, the geospatial industry has finally understood the need for analytics. The start-up community has fostered a rapid pace of innovation, and the Location Analytics and Space 2.0 communities, in particular, have completely challenged the incumbent business models and cost structures. This was reflected in a Geospatial World survey of 100+ CEOs and business leaders of the industry, where majority of respondents viewed increasing data analytical capabilities as one of their top areas for investment over the next three years. Naturally, the Geospatial World survey also saw business leaders voting for integration of artificial intelligence, machine learning and Big Data with geospatial as the next big thing for the industry. Further, they felt that the optimal use of Data Analytics and predictive technologies would be the top technology challenges facing the industry in the next three years. Data is always more valuable in combination with more data, and proper machine learning requires all the data, all the time. So the integration of data — and the technology that makes it most useful — will continue to be a focus, underlines Mark Johnson, CEO of Descartes Labs, an AI-focused start-up which is building the first live atlas of the planet. “Geospatial data gives companies the ability to understand what’s happening in the world around them. Data is becoming more critical to business success. Understanding the planet, supply chain and organizations’ operations is only possible with data that has the critical context of time and place,” he says. Active sensors like Synthetic Aperture Radar (SAR) can provide day and night coverage and eliminate obstruction by clouds. An interesting application of SAR is in the detection of ‘dark’ ships, i.e. ships engaged in illegal activities. The small satellite constellation from Spire, an earth observation start-up, tracks ships through their Automatic Identification System. When such a transmission ceases then the data is merged with a SAR satellite data to get the position of the ship and track it down. 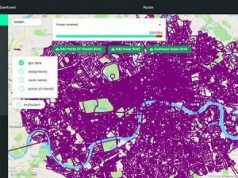 Similarly, Capgemini has developed a machine learning framework that uses SAR satellite imagery to identify woodland with newly planted trees. Efficient analytics in short time spans can lead to groundbreaking developments. Planet, which currently operates 200+ satellites, in 2017 completed its Mission One—to image the entire Earth every day 24×7. In 2018, it also launched a platform to harness and analyze all this information. The platform, which will index physical change on Earth the same way Google indexed the internet, as Will Marshall puts it, aims to provide users ways to get the information they need to make smarter decisions. Geospatial AI or Geo.AI: Geospatial AI, or simply Geo.AI, is a subset of AI that combines the exactitude of GIS with the razor-sharp analysis and solution-based approach of AI. It is a new form of machine learning based on geographic content. Through intelligent algorithms, data classification and smart predictive analysis, Geo.AI can come in handy in a number of sectors, including those that use location and GIS. Ride-sharing companies, logistics and supply firms, farming, surveying and infrastructure are some of the prominent examples. In logistics and supply chain, Geo.AI can plug the gaps and gather more accurate location information that can streamline product delivery and save time. Analytics requires a constant flow of data from a variety of sources as well as opportunistic data like social media, transactional data, data from neo-geographers, volunteered data and data like smartphone locations, to name a few. Among the data sources available are satellite data and UAV data. One of the banes of satellite remote sensing has been the unavailability of 24X7 coverage, the other one being the problem of cloud cover and the limitation of daytime imaging. While the latter has been solved through SAR satellites, the former continues to bedevil the remote sensing community. The roadblock to 24X7 coverage has been the cost of conventional satellites, both optical and radar. Enter small satellites, seamless data flow, drones and there is a host of possibilities. 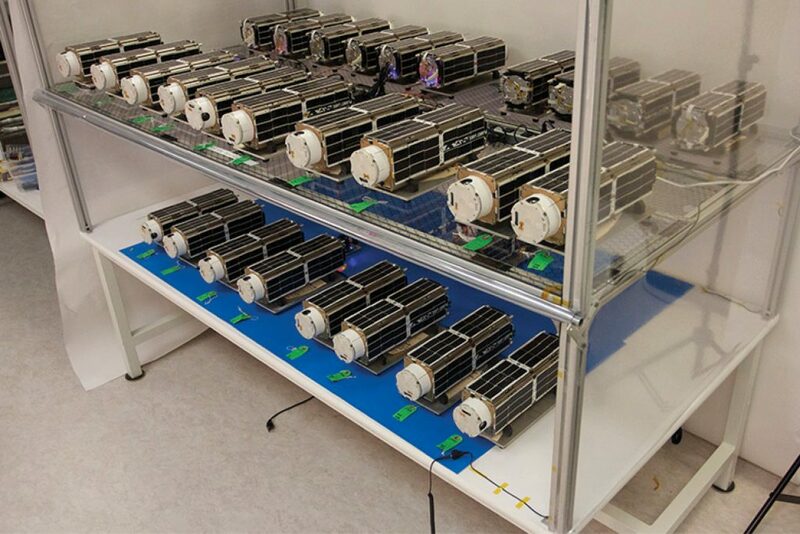 Small Satellites: Planet spearheaded a paradigm shift in the satellite industry after it launched satellites as big as breadboxes using miniaturization and off-the-shelf parts. In the past seven years, 663 commercial small satellites have been built, over 80% of them for remote sensing, 75% by Planet and Spire. Reduction in the size of satellites goes hand-in-hand with increased efficiency and reduced cost. For instance, with over 200 satellites in orbit, Planet is now capable of imaging the Earth once per day. Now, the company wants to turn their data into a search engine of the world via its next mission. Such advancements not only promote innovation and democratize access to space, but also mean easy availability of a lot of data. Profusion in the availability of EO data has led to better insights, improvement in data analytics and service delivery. Such 24X7 coverage is found extremely useful when cloud cover is an issue, particularly for crop watching, disaster situations and where security is involved. We have seen how such imagery has been used to examine the effects of the recent aerial action by India against terrorist hideouts in Pakistan. Drones: Drones are versatile as a platform for various sensors and are in use from logistics to defense. With favorable drone policies and lower prices, they are being used for aerial mapping. The industry is likely to witness rapid expansion of drone mapping in sectors like agriculture, mining and construction, and is expected to cross the $100 billion mark by 2020, according to a Goldman Sachs research report. “Use of drones as a data capture tool has been a big technology game changer for the geospatial industry in recent times,” feels Anil Nanduri, General Manager, Drone Group, Intel. Drones, equipped with high precision sensors, can be flown over farms to gather data, which could be utilized to map pest damage, crop stress and per hectare yield using GIS analytics. Drone imagery can help farmers remotely monitor activities on their land. AI, Virtual Reality and LiDAR sensors are some of the technologies that will radically transform drone applications. Convergence of drone technology with machine learning and AI helps infrastructure managers identify quality defects, malfunctions, or inventory shortages much faster than any other method. Chinese drone manufacturer DJI has emerged as the leading drone maker and holds the lion’s share of the drone market. Last year, DJI launched its smallest drone, the Mavic Air, which was of the height of an average smartphone. The device is capable of a variety of features, the snazziest being “Asteroid”, which creates a 32-megapixel 360-degree panorama that can be pulled back and viewed as a “planetoid”. Democratization of LiDAR: LiDAR sensors have been around for sometime and are being used extensively for aerial surveys and terrestrial mapping. Till about two years back, it was only the geospatial and infrastructure community that was talking about it. Suddenly, this new major sensor is disrupting the automotive industry. The escalating demand for driverless cars is providing the automobile industry with ample opportunities to embed LiDAR in their systems. Massive investments from venture capitalists and a flurry of partnerships and acquisitions in the LiDAR domain hint at the size of this burgeoning market. According to a December 2018 report by Market and Markets, the global LiDAR market is expected to cross $3 billion by 2022 and will witness a compound annual growth rate (CAGR) of more than 12.1% in the given forecast period. And it is not just the automotive sector, the demand for 3D scanning and HD maps has seen LiDAR sensors going up on drones. This means that the traditionally bulky and expensive sensors had to be drastically modified, making them smaller, lighter and of course, cheaper. Professional LiDAR surveying scanners are now available for as little as $100,000 and weigh around 7kg. Crowdsourcing: Smartphones in every hand has seen crowdsourced data emerge as one of the primary sources. Crowdsourcing of data can be both voluntary and opportunistic. Smartphone locations are harvested to determine traffic flow, thereby locating snarls and suggesting alternate routes. Another source of opportunistic data, apart from smartphones, is miniature wearable sensors in jackets, smart watches and fitness trackers that have become integral to sports, medicine and other related sectors. With the help of simple smartphone applications, people can volunteer real-time conditions. For example, traffic congestion, current details, peak hours, time taken to cross a particular stretch, etc. is fed in real time to an analytics engine which can then suggest alternate routes. Post facto these data sets can be used to plan out road widening, accident zones, synchronization of traffic signals and so forth. Crowdsourcing ultimately enhances the accuracy because of thousands of users contributing to the database, thus reducing the occurrence of errors through a process of curation. Scanners: Other than smartphones and tablets, 3D scanners are a good example of handheld devices. The operating mechanism of a 3D scanner is similar to that of a video camera, but it captures an object in 3D while continuously scanning it. Companies like Xbox, Matter and Form and B&Q are manufacturing 3D scanners that are compact and lite — some of them weigh less than a pound. Innovative launch options: Ease of manufacturing small satellites has seen the number of such satellites ready for launch far exceeding the number of available launchers. For instance, in 2017, 50 British small satellites couldn’t find a launcher. That is because big launchers like the SpaceX’s Falcon 9 or ISRO’s PSLV need a minimum payload weight to optimize the huge costs. Thus, small satellites need to wait till a piggyback opportunity is found. This may soon come to an end as many government and private agencies in USA, India, Russia and China are working on dedicated small satellite launchers to fill in the demand-supply gap. These small launchers can be assembled and launched very fast and will enable quick replacement of malfunctioning small satellites in orbit. Other dedicated small launchers, ride-sharing options have also come up in a big way and will see major traction in times to come. The new chapter that started with ISRO launching a record 104 satellites – 103 of them small in size, of which 101 from foreign countries – has only advanced leaps and bounds in the past years. Smallsats piggy riding big satellites on a rocket has become a norm, and ride-share organizing on rockets a legitimate business. Last year, SpaceX set a new milestone when it launched a small-sat only mission called SSO-A: SmallSat Express. The mission was organized by SpaceFlight Industries and had satellites from more than 30 countries. Ground station as a service: A ground station is a crucial intermediate link that receives transmitted information from satellites and then processes and distributes it. There are companies providing “infrastructure as a service” to the space economy by aggregating ground stations and enabling communications for satellite operators. What initially began with ridesharing of small satellite payloads took a gigantic leap last year when Amazon launched its AWS (Amazon Web Services) Ground Station, thus pioneering another new trend that is poised to transform the commercial space industry. Amazon Web Service will provide ground station as a service through a network of 12 satellite facilities around the world, and by next year, the tech giant intends to start operations. Virtual Reality, Augmented Reality and Mixed Reality are technologies that have moved from the gaming world to geospatial, thereby enhancing geospatial visualization and analysis. Virtual Reality provides an immersive experience in which the viewer can move around in a virtual environment and interact with virtual objects. Fly throughs enable close examination of terrains and walk throughs help in understanding levels of detail in a planned structure. Augmented Reality enables the overlay of virtual objects on a real world scene. Perhaps the best example is the game Pokemon Go that has elements of location, hence geography built into it. A more serious example is the overlay of information about an object in the view of a smartphone camera, which utilizes the location of the viewer, the imaged scene and a library of information about the scene. The display of the information is on the screen or on a device like Google Glass. Mixed Reality is like Augmented Reality with the addition of the ability to anchor the virtual imagery to the real world. Leica Pegasus Backpack is a wearable reality capture sensor platform. The backpack’s ergonomic design combines five cameras offering fully calibrated 360 degrees view and two LiDAR profilers with an ultra-light carbon fibre chassis. It enables extensive and efficient indoor and outdoor documentation with high accuracy. Microsoft Hololens 2 is an immersive, instinctual and comfortable experience for first-line workers. 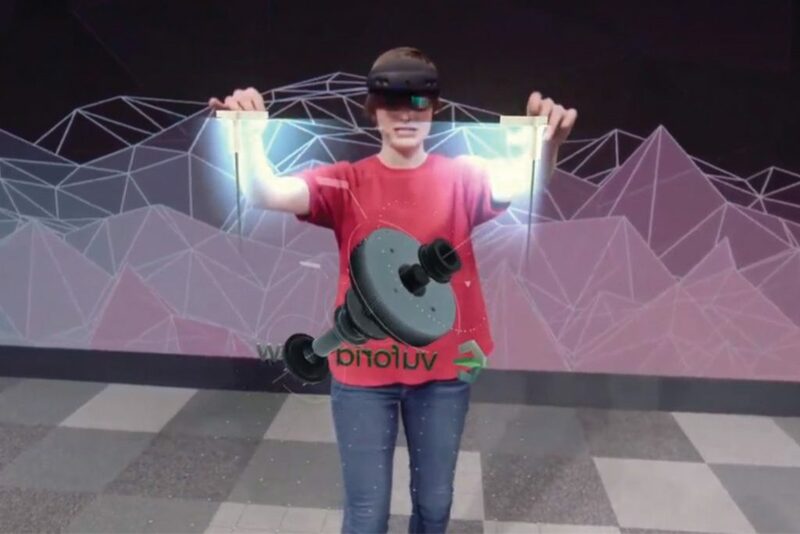 Microsoft recently launched HoloLens 2 in an effort to bringing augmented reality into the workplace with its new Microsoft HoloLens 2 headset. It is “more immersive, instinctual and comfortable experience for first-line workers”, according to Microsoft. With the new Azure Kinect sensor, the HoloLens 2 headset has optimized eye tracking. Paired with the Azure Digital Twins service, users can see machine information and data through IoT sensors with just a glance. Maps were earlier designed for human-to-human spatial interaction. However, with the advent of digitization and requirement for high precision, maps are now being designed keeping in mind the human-machine and machine-machine interfaces. Instantaneous maps are created, read and analyzed by machines, a typical example being a self-driving car or a robotic assistant to help you in a mall. “In the era of autonomous driving, cars will share and receive real-time data about what’s happening on the road, and this is where HD maps and advanced connectivity will play a crucial role,” believes Ian Huh, SVP IoT/data Division Head at SK Telecom. “Making maps visually pleasing and readable for people has always been a top priority. However, machines do not need a positive user experience. They require high precision and up-to-date information,” says Nikhil Naikal, CEO, Mapper, a start-up making globally scalable ecosystem for on-demand creation, validation and maintenance of highly accurate maps that are crucial to the success of self-driving vehicles. These maps also serve as digital infrastructure for safe, efficient and reliable automation across a spectrum of verticals. There is, however, a downside to HD maps. Not only are they expensive, but also a huge amount of data cannot be transmitted over normal cellular networks. One way of dealing with this problem is categorization of information: the one that requires sharing real-time and the other that isn’t worthy of it. HERE is looking at building a global mapping system that will provide HD maps to autonomous cars. For this project, the company has forged partnerships in China, Japan and Korea. “Automakers building self-driving cars are thinking globally and want an HD map that can scale with them. This simplified way of sourcing the map will also help reduce development time and unnecessary cost,” Ralf Herrtwich, SVP Services at HERE Technologies, had said recently. German automaker Daimler has partnered with HERE Technologies to make HERE HD Live Map an integral part of its autonomous driving technology. BMW has also announced that it will be using these maps. These technical developments have resulted in some very significant applications that were not possible to implement earlier due to the paucity of relevant data and the kind of computing power needed to run AI algorithms. BIM: Building Information Modelling (BIM) has been around for quite some time, but its integration with geospatial technology has been slow. Nicholas Mangon, Vice President, AEC, Business Strategy & Marketing, Autodesk, is of the view that technology will change this scenario significantly. “Technological advancements collectively will transform the AEC industry, a sector which hasn’t seen major productivity increase for over 20 years,” he says. Integration of geospatial information with design and engineering workflow data, 3D modelling, simulation, scenario analysis, change detection, etc. can deliver the much-desired seamlessness among different spatial and non-spatial datasets. 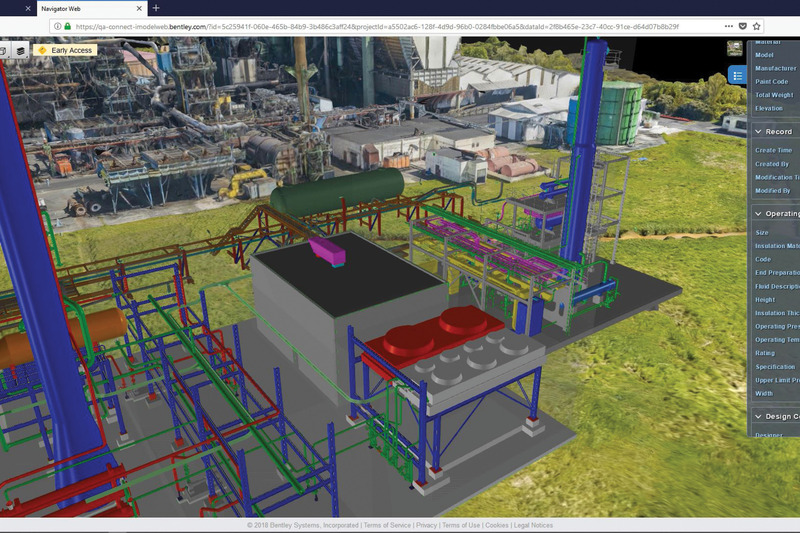 The interface between geospatial and BIM creates a binding synergy between spatial, technical and commercial data attributes, helping the construction industry to devise cost-effective and timesaving models. A combination of the latest developments in computation with geospatial enables precise analysis of projects, which fosters innovation, reduces cost and cuts down manpower requirement. Architects and engineers are beginning to use these models for better understanding of projects. With the increasing use of Augmented Reality and Virtual Reality, AR and VR, in BIM modelling, the utility of geospatial would further increase. Digital Twin is a technology which fuses BIM CAD with a built reality through a process of Augmented Reality using sensors and imagery. Digital Twin: Digital Twin is a technology that fuses BIM CAD with the as-built reality through a process of Augmented Reality using sensors and imagery. A Digital Twin is particularly useful to detect conflicts of the digital plan with the physical reality. It enables the trapping of potential problems and helps in realizing corrections before the problems become critical. Large structures e.g. offshore platforms, offshore vessels etc., Buildings and Utilities (Electric, Gas, Water, Waste Water Networks) are some of the possible areas for the monitoring, diagnostics and prognostics to optimize asset performance and utilization. 3D printing in the context of digital twinning is also one of the technologies that can be used for simulation of major constructions like factories and infrastructure like bridges to understand potential problems. Smart infrastructure: Smart Cities have opened up a host of new possibilities, improving the quality of our urban spheres by making citizens more connected with their cities through technology. These cities would provide a holistic living experience by reducing congested spaces, pollution and taking the basic architecture of urban planning models to a citizen friendly trajectory. 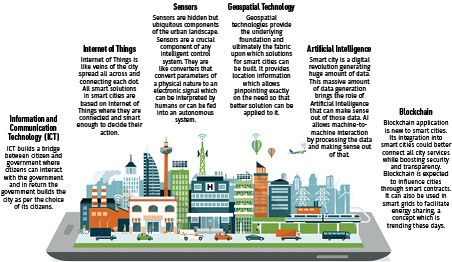 Smart Cities are perhaps the harbinger of Geospatial 4.0, where the citizen becomes the focus of all planning, building, monitoring and executing activities in urban spaces. Citizens become smart citizens with technologies like e-governance, crowdsourcing and volunteered information that enable participation by citizens in these activities. Smart transportation uses a plethora of systems to manage systems like car navigation, traffic planning, security, container management and many others. The technologies include GIS, communications, IoT, in situ sensors, location based systems and crowdsourcing. Location based services: Location based services are important for citizens, businesses, disaster management, farm and livestock management and C4ISR, to name a few important areas. The power of location influences multiple fields of life. 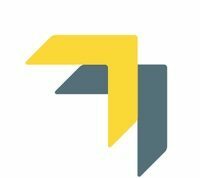 Be it the most quotidian services like hiring an Uber cab, or niche data analytics for a business strategy, location is at the core of all processes. These needs are met through satellite based navigation services, accurate maps and a variety of devices. Location-based services are expected to reach a market size of $1.89 billion by 2022. Emerging technologies like the Internet of Things (IoT), autonomous vehicles and sensors are capturing information that has never been captured before and creating new avenues for geospatial data collection. Location intelligence is providing the exactness of spatial dimension to businesses, enhancing customer experience and increasing revenue and operational efficiency. “The practical applications for location technology are endless. Big Data, touted as the new oil, provides a landing platform from which we have only just begun to see the possible innovations of future,” says Dr Steve Marsh, Founder and CTO, Geospock. “In the end, all industries stand to benefit from comprehensive location data and intelligence, and there are many fruitful partnerships that will be built,” says Gil Elbaz, Founder and CEO, Factual. The next phase of growth for the geospatial industry, where it will see mainstreaming, will require ‘impact validation’ of using location intelligence. “Customers would need to know how this technology is proving effective in their day-to-day life and businesses,” says Sunil Kumar, Founder & CEO, GroundTruth. As the world marches towards the age of automation, geospatial would be a key technological component. The Fourth Industrial Revolution would be a seamless integration of humans and machines and from piecewise automation to full-fledged automation, which Ola Rollen, President and CEO, Hexagon, calls “evolution from automation to autonomy”. “Traditional GIS is hitting scalability limits due to emergence of Big Data. We expect a major shift in 2019 to address this issues,” says Kathryn Guarini, Vice President, Industry Research, IBM. Indeed GIS database will now become database of algorithms to be applied to fast moving real time and near real time data. Geospatial 4.0 seeks to seamlessly integrate geospatial services with humans in a connected world. There are many names associated with such a move. Internet of things will be replaced by Internet of Everything, where ‘everything’ will include humans. Artificial Intelligence will play a major role as has been stated earlier but human intelligence cannot be replaced. Amy Webb outlines a doomsday scenario in her book The Big Nine if to demonstrate what happens if we apply AI indiscriminately and individually. The solution she puts forth is to use the powers of AI in a collaborative manner for the best interests of humanity. Geospatial advances are intimately tied to the betterment of the human condition. We need collaboration not only within the industry, but also with other industries and citizens for this to happen.